Cleaning brick is another service we perform with superlative results. 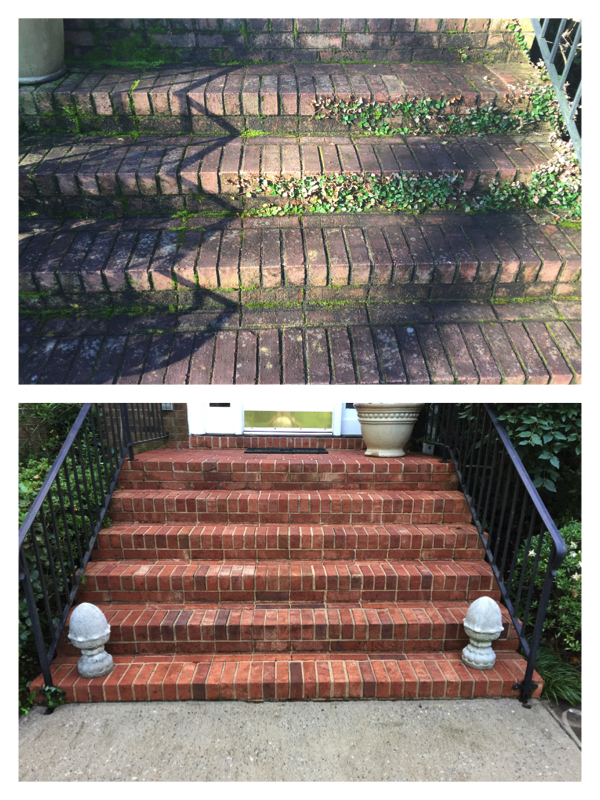 There's not much we can't handle when it comes to removing soil and moss from brick. In the extreme case where the extraction process will not work, we will bust out the gas operated pressure washer to remove the heaviest soil load. It's usually a large buildup of moss that must be removed in those cases, but nature can throw some tough pitches. The second law of thermodynamics states that matter, systems, structures, and everything else have a tendency to go from a state of order to a state of disorder. Things tend to break down, like that lawn mower you keep having to rebuild. Nature is one of those systems that tends toward chaos. Those brick steps tend to break down as a result of not only weather, but the plants that want to grow in the tiny cracks caused by nature. If we don't insert work into the system, as in upkeep, the creation (those steps) will crack up and eventually start to fall apart. ​That is why you want to periodically clean your brick!